View the 2019 Sponsors and Exhibitors. We invite you to attend the meeting for cleft and craniofacial specialists – ACPA’s 76th Annual Meeting. As a sponsor or exhibitor, you can showcase your products, speak to professionals about trends, and network with 750-850 professionals – while you maximize exposure, work directly with decision makers, and network and learn with attendees. ACPA is an interdisciplinary association of healthcare professionals who treat and/or perform research on oral cleft and craniofacial conditions. ACPA represents more than 2,400 professionals in 30 healthcare disciplines in 60 countries who serve an extremely important role in the treatment of patients. 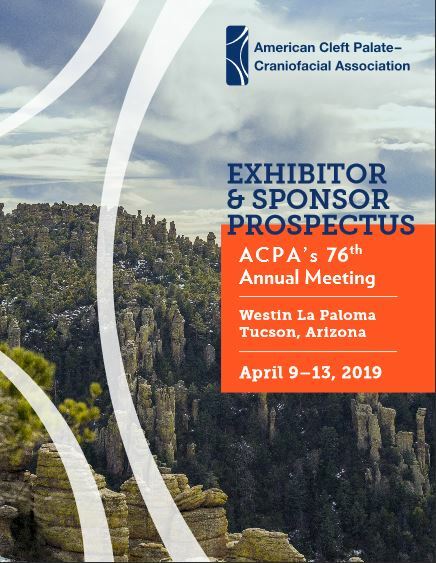 Your participation in ACPA’s Annual Meeting is essential to our success, as your products and services enable attendees to deliver optimal patient care. View the Exhibitor and Sponsor Prospectus. Sponsorships range from Bronze ($2,500) to Platinum ($20,000). View the 2019 Sponsor Contract. 2018 Options include Exhibitor and Exhibitor Plus Tables. View the Exhibit Contract. We invite you to join us so that you can meet and network with this unique membership base – and deliver your message to this targeted group. View the 2019 Exhibitor and Sponsor Prospectus.